Today I head off with the Grimbleby family to the south of Spain for 5 days. 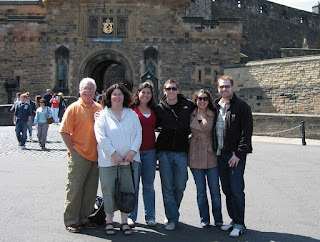 The other day while at the Edinburgh Castle, we had someone take this picture of the family. It really is a good picture. And, this good picture got me thinking, I don't think there have been very many pictures taken of the six of us together (I know there was one from our wedding and one with all of Ian's aunts and uncles and cousins at Christmas a couple of years ago), even though I have technically been a part of the family for the past 5 years. What does this mean? Do we not get together often enough? Do we have an aversion to cameras? Or possibly an aversion to each other? Kidding! The older I get (seriously, I am getting up there), the more I realize the importance of family. When other people won't be there for you, family will. When you are celebrating something big, they are the people that will celebrate with you. When you are going through something hard, they will be the ones to walk through it with you. The only thing is, we (by "we", I mean me and all of you reading this) have to be vulnerable and allow them into our lives. This vulnerability means we open ourselves to hurt, but we also open ourselves up to a love we have never experienced before. An unconditional, bail you out of jail type of love! Though I am scared of being hurt (I may seem like a tough one, but I really am not), I think it is time that I let my guard down and learn to truly love and be loved by this group of people I call family. I can't wait to read and see pictures of your trip! Have fun with the fam.